Happy New Year! 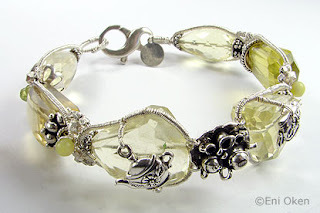 This year I decided to join the Year of Jewelry project once again. The group has established a new format starts the year with the calendar year and is divided into four quarters instead of seasons. For full information on the 2007 YOJ, click here. My word for the year is "LIGHT". Light as in easygoing, but also as in full of light, which I hope this year will be. For this YOJ, I decided to not establish too many goals, just go with the flow. Probably most weeks my entries will be commissions, but that's ok -- you'll get to see what I'm working on at the time. 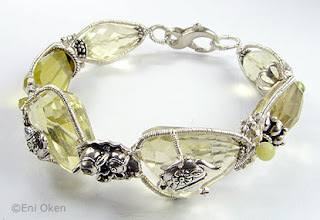 For my first entry, I'm posting this Lemon Tea Bangle, which is part of a couple of commissions for some special clients -- I have to produce a total of 13 of these babies. 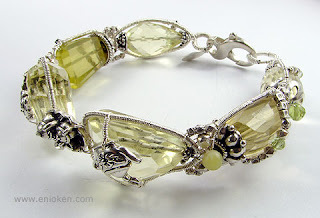 The lemon quartz stones are a little bit more impressive than the ones used in the original Lemon Tea Bangle, and also more random looking. At the center of the bangle, the tiniest tea set, flanked by two flat teapot charms.